I’ve decided that every Monday until my book is released I’m going to post a section from it on my blog. I guess I’m starting on the second Monday in January, but oh well. Let me know what you think! Whoever thought it was a great plan to send an eighteen-year-old college student to see the youngest, hottest psychiatrist in town was an idiot. I arrived at Dr. W.’s office on Oak Street with my army jacket pulled as tightly around my shoulders as possible without collapsing my chest in too much. My friend Chris had given me a ride and planned to stay in the waiting room and drive me back to campus. We settled into a love seat with his arm around me, my head buried in the space between his shoulder and chest. The walls were the color of the inside of a cereal box and the furniture was comfortable and newish. The heat was slightly higher than it should have been, giving the reassuring impression of being snuggled in a warm blanket. Doctor W. stepped out from the hallway, “Milly Hinton,” he said without looking up from his clipboard. I extricated myself from my friend’s arms as Dr. W. glanced up to locate me in the room of waiting patients. 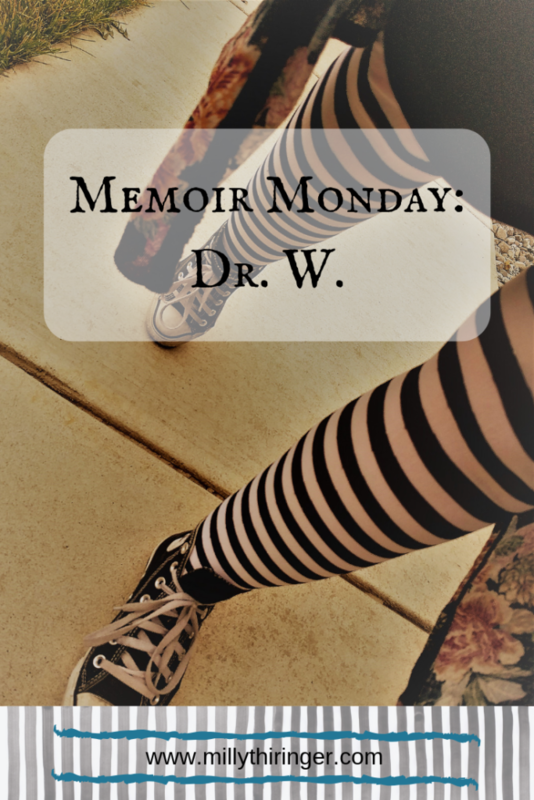 I shuffled my combat boots along the gray office carpet, which is always different from the carpet you find in people’s houses, my black and white striped tights making a crosshatch pattern when hit with the sunlight through the vertical blinds. I followed him into his office where his desk was peculiarly placed in the corner, away from what was supposed to be a conversational area of a love seat and two sofa chairs surrounding a stone slab coffee table. There was a fish tank with a hexagonal base on an end table; I chose a sofa chair and fixed my gaze on the fish, not planning to talk to this guy. Dr. W. was a freshly-minted psychiatrist, I’m sure. He couldn’t have been more than 26 years old, and he had a 90s hangover with black rimmed, rectangular glasses and spiky hair. And man, was he hot. Nope. Not talking. “No.” I was starting to see where this was going, but he was way off track. “He’s your boyfriend.” Dr. W. stated with an inordinate amount of satisfaction in his voice. “No, he isn’t. He’s my friend, and he’s like a brother to me. But he is definitely not my boyfriend.” I was exasperated a whole forty seconds into this therapy session. If he isn’t going to believe me, why am I here? I started to lose track of the locations of things. I saw myself both facing the fish tank, and spun around in the opposite direction, facing the wall of oak bookshelves. Dr. W. recommended a book. He said I seemed sad. I told him I heard voices and when I walked down the street I ducked from things coming at my head that I guess weren’t there. I told him there was this little girl and a man in a military uniform who follow me around. First there was a wall of windows in his office, then none. Then I wasn’t facing his bookshelf anymore, I was facing mine, in my apartment. The books tumbled down on my face. I fished out my journals and threw every last one of them in the green trash bin outside. I left with a prescription for Risperidone and a slip of paper with the name of a book. “Come back in a month.” For thirty minutes a month he prattled on about things I’m sure he’d learned in textbooks while I stared at his fish. My friend, Mel, wrote this poem in college and I mostly don’t remember what it said. But it was about psychiatrists and used the play on words of “shrinking.” The only line I recall is “Or perhaps a smaller me than before.” That’s how I felt about Dr. W. I got smaller and smaller until there was just this shrink in a room talking to his couch cushions. I wasn’t even there anymore. The time jumping got worse. I didn’t take the medication the way I was told. Every few weeks I was back in the hospital. Nobody came to save me. I guess I have to save myself.